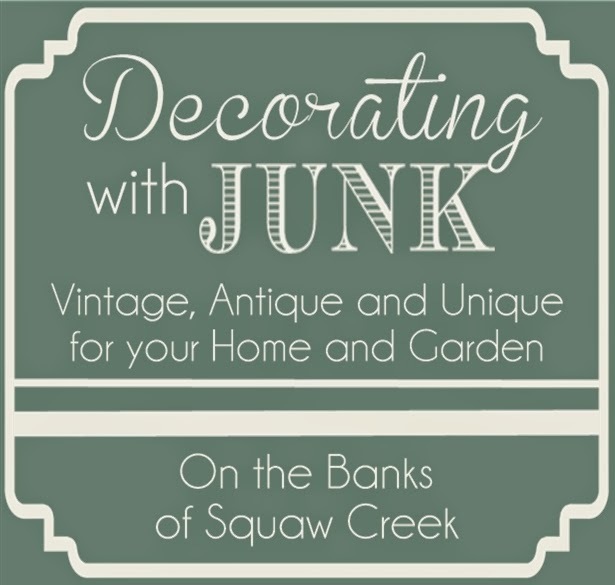 Today I have another guest blogger for you! 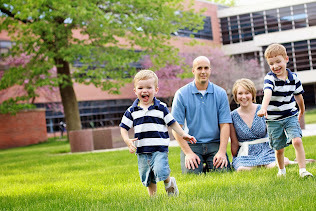 She is also an Iowan and has been one of my bloggy friends for a long time, now. 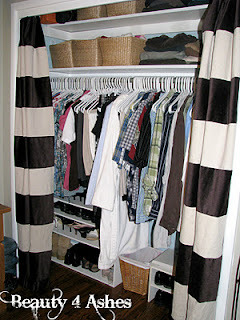 AND, she just happens to have the most beautiful closets in the blogosphere! Hello! My name is Ellie and I blog over at Beauty 4 Ashes. I live with my husband and three boys in a 1200 sq. ft. ranch in the cornfields of Iowa. Our ranch-style home has three bedrooms and was built in the early 1960s. It received very little love in the first 40 years, but we're slowly painting, organizing, modifying and renovating every square inch of it! Last fall my husband redid our hardwood floors and we took the opportunity to switch a couple bedrooms around. I also took the opportunity to clean out, paint and organize each of the five closets that had their doors taken down in order to get the hardwood floor sanded, stained and sealed. One last closet, for a total of six for our house, got a yearly sort and organize session too! Let's take a look at each of those six closets. First up is our master closet. We don't have a real master bedroom--in fact, we gave the largest room in the house to our boys. Our closet is definitely on the small side! I chose to use a curtain instead of the sliding doors that were there because then both my husband and I could open our sides of the closet at once--and so I could add some stripes to our room! You can see the rest of the room HERE. As you can see, I used all white hangers as well as white shelves. My husband built in an additional shelf at the top of the closet (one was already there) and we used stacking shoe shelves from Target (that I bought about 10 years ago). I also use baskets for some of my clothes but my husband prefers to stack his clothes. I took the time to paint our closet blue--our ceiling is blue too--and I love how it looks! In addition to this closet, my husband and I each have a dresser in our room. Our two older boys (ages 2 and 4) share a big room with a larger closet, but you wouldn't exactly call it a walk-in. I guess I have something against sliding closet doors, because I left them off here too! As I was trying to find a good layout for the rest of their furniture and toy storage, it just made sense to shove the dressers in the closet! I painted the shelf blue, added blue storage bins for out-of-season and too-big and too-small clothes to the top of the closet. Behind the dressers are maps all over the walls--there are maps in the rest of their room too. You can see their room tour HERE. One dresser has a few things displayed on the top while the other is still used as a changing table. All of their clothes are folded in their dressers except for church clothes. I added this small shelving unit for extra diapers, sheets, and a few shoes that aren't used a lot. Most of their shoes go in the entry closet which you will see shortly. You can also see a diaper pail and a laundry bin in there. Our youngest son is 9 months old and is the only person in the house who doesn't share a room! Yet. He will probably move in with his big brothers one day, but for now he has a sweet little nursery all to himself. You can take a tour of it HERE. Oh look! No door! This small closet was the first one to lose its doors, actually. Once again, I was looking for more square footage in this tiny 12 x 12 room! I use this shelf for display on the top and for some of Baby's toys near the bottom--big brothers use them a lot too! 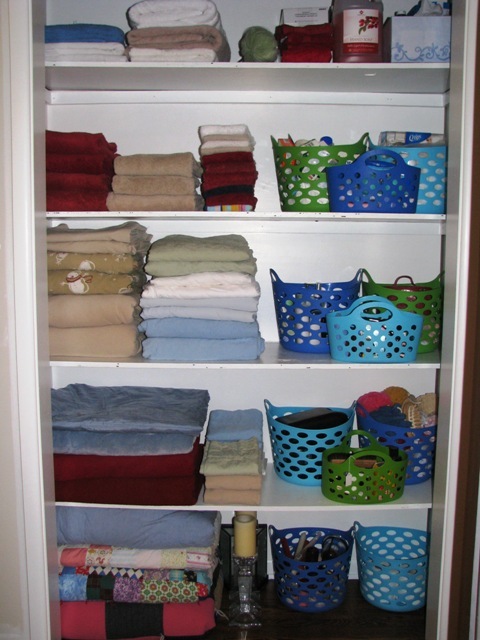 There are two bins at the top of his closet for clothes as he out-grows them, then they're switched out to new sizes and seasons from the bins in the basement. Behind the bedspread-turned-curtain are some of Baby's hanging clothes. 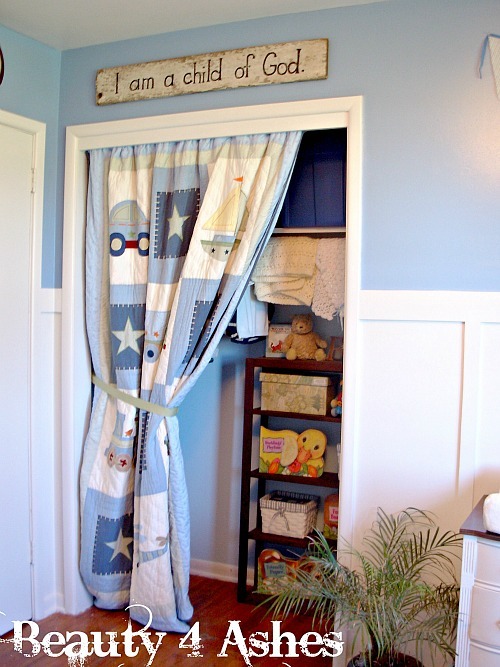 He has a dresser as well where most of his clothes, blankets and extra diapers are stored. You'll never guess what we have here: a closet with doors! There are two like this in our hallway. I'm hoping to reveal my hall makeover this week! There was lots of unpainted trim not long ago. The closet closest the bathroom holds linens on one side and extra toiletries and cleaning supplies on the other. I used bins from the dollar store to corral extra soap and shampoo, travel toiletries and all sorts of things! You can get all of the details HERE. The next closet I turned into a craft closet! I love to scrapbook but had no where to store my supplies that was convenient. Since I've dedicated this space, I've found myself using crafting more often! You can get the full tour HERE. For this closet, I painted a bookshelf white, crammed it in the closet (good thing the doors were off!) and added some display areas and as much storage as I could! These photo boxes were only $2 at Michael's and I use them for stamps, stickers, cutters, etc. The last closet on this tour is actually the first one you'd see if you came over for a visit! Our entry is seriously lacking in the space department. There isn't even room for a table or shelf for keys and mail! Luckily this closet is pretty close to the entry, so it got turned into a coat closet and mudroom. Here you can see where I stash my diaper bag, my husband's lunch box and hat on a shelf above the coat rack. On the side I stacked more of those white shelving units! And more dollar store bins for hats, gloves and scarves. The other side holds more coats as well as a vacuum and broom. Here you can see that bright green bin--that's where my boys keep their rain boots, tennis shoes and play shoes. The bin catches dirt, and it's super easy to get my boys to put their shoes away when we come inside! Did you also notice the back wall? Green stripes are a fun surprise! Want to know what they are? No way am I going to tape and paint all of those tedious little lines... It's contact paper! 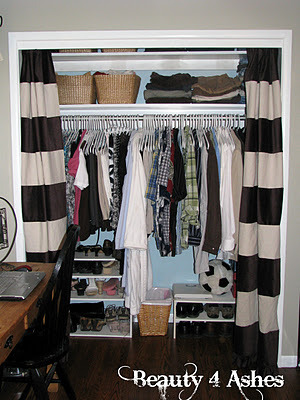 You can get more information about this coat closet/mud room/pantry HERE. Thanks for taking the time to see our closets! 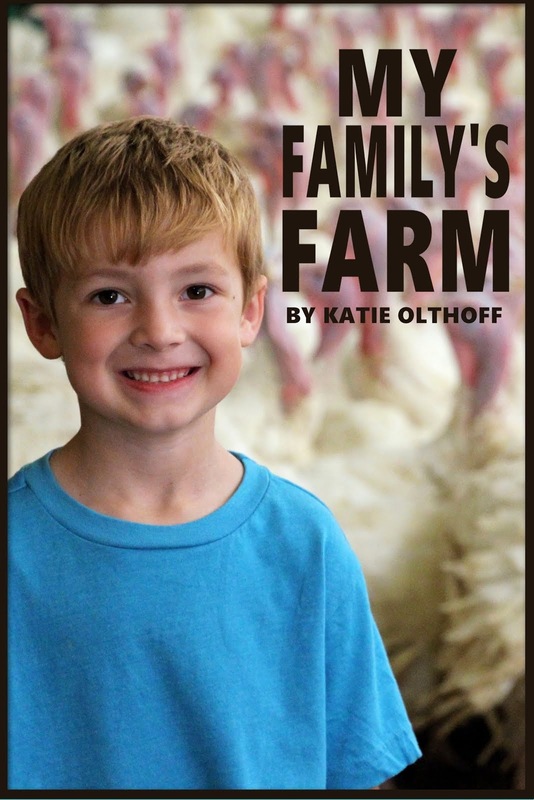 I hope you've enjoyed Katie's Small Homes series--I know I have! Please stop by Beauty 4 Ashes whenever you can!